Things are really starting to take shape. 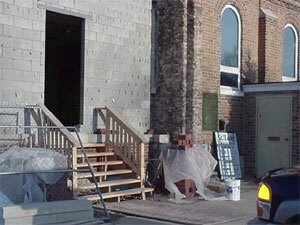 The brickwork continues on the front of the building and in the staircase area. 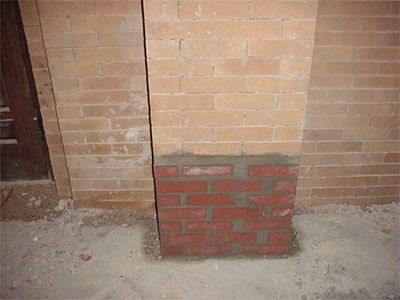 Temporary entrance to building is shown and the old brickwork removed for the corner of the existing structure. 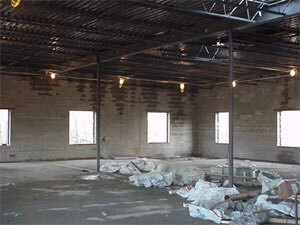 Here we can see the inside of the building with the roof overhead. This gives us an idea of the actual size of the space involved. Also we see a view from the inside looking out where the entrance to the new building will be. 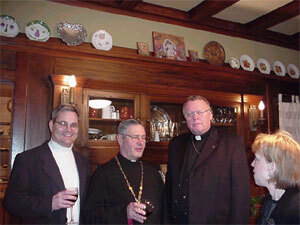 His Grace Bishop Job (His Grace Bishop Job: Biography Page) made his Lenten visit to St. Luke on Wednesday March 27th. Before celebrating the Presanctified Liturgy he blessed our new Iconostas. Rob Ketchmark a member of our Parish family constructed it of oak. The Icons (see Iconography) in the Iconostas were painted in the traditional egg tempera method by Heather Mac Kean. Heather, who resides in Portland, Oregon, recently finished the Royal Doors which hold icons of Solomon, David, the four Evangelists and the icon of the Annunciation of Mary the Theotokos. 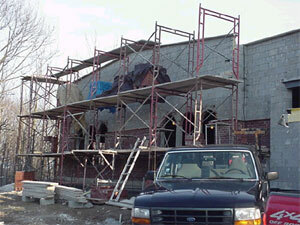 Brickwork continues as almost all of the cinder block work in completed. In this picture you can see the new window opening on the left, the area for the entrance to the new building in the center, and in the right foreground the base of the new bell tower. 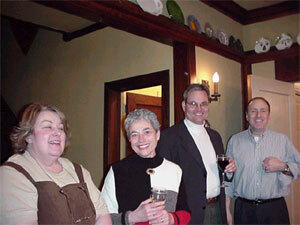 Fundraiser For Orthodox Translation Of Old Testament A Success. 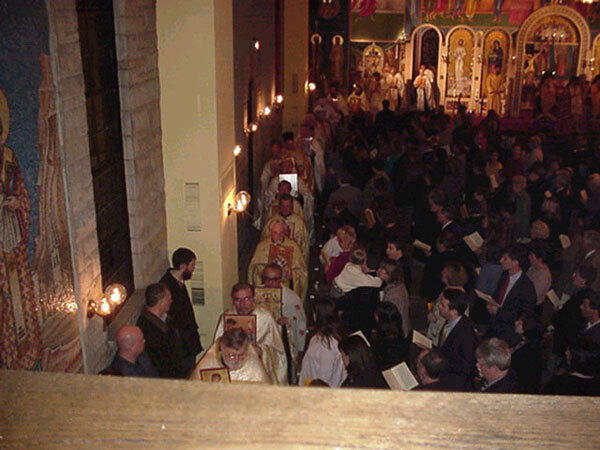 On the evening of March 16, 2002, several Orthodox Christians from various Orthodox jurisdictions gathered at the home of St. Luke parishioners, Ken and Carla Stevens. Fr. Peter Gillquist (Dept. of Missions and Evangelism, Antiochian Archdiocese) described the process, progress, and needs of the Old Testament Project currently being carried out at St. Athanasius Academy of Orthodox Theology in Elk Grove, California. The project's goal is to produce an English-language Orthodox Old Testament from the Septuagint version that was completed in 246 B.C. (This is the only version of the Old Testament that is recognized by the Orthodox Church). 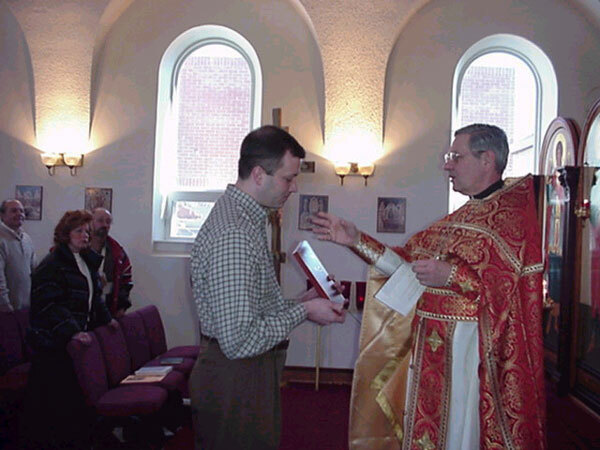 In response to a mailing entitled "A Call to God's People in Chicagoland," over $16,000 was presented to Fr. Peter that evening. Money still coming in will bring the total to over $25,000. 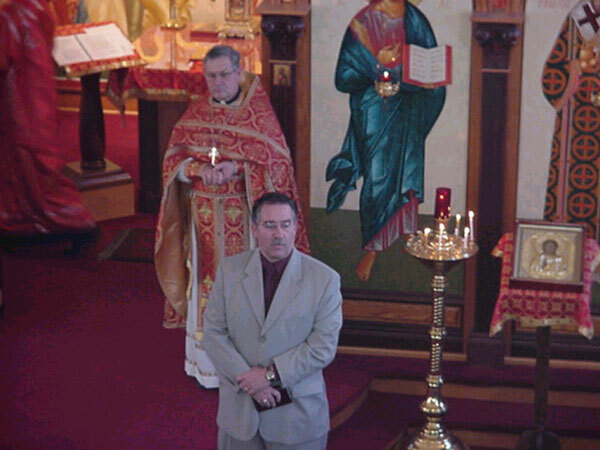 Included in the pictures above are Bill Morrison (Antiochian Orthodox, Warrenville) and Speros Kinnas (Greek Orthodox, Westchester). Peter Jokich (Serbian Orthodox, South Chicagoland) and Lou Milicich (Serbian Orthodox, North Chicagoland) were also present. 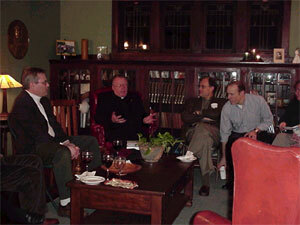 All of these men, as well as St. Luke parishioner Lee Kopulos, facilitated the mailing. 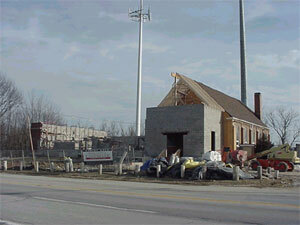 With the streak of good weather, the construction project is really starting to roll along. 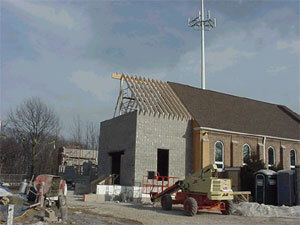 Below you can see the cinder blocks forming the new narthex of the church and the beginnings of the roof in this area. 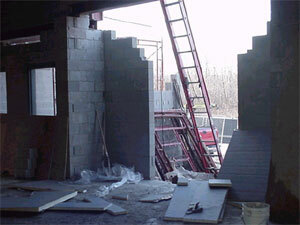 The second picture shows a side view from inside the new building. 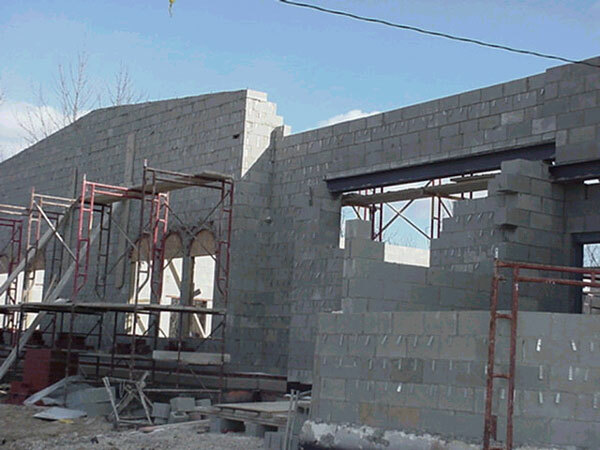 In the lower right hand corner is the beginnings of the bell tower and on the second floor of the cider blocks, you can see the opening into the choir loft that will allow access from the bell tower. 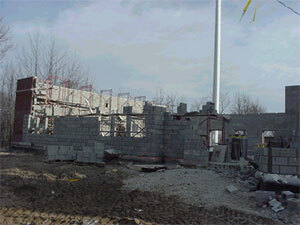 Below we can see the beginnings of the front wall of the new addition. 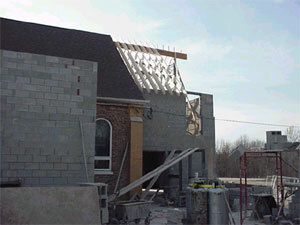 The other view gives us an idea of how much more the addition will add to the existing structure. 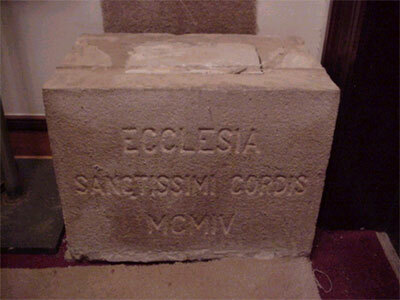 On March 11 the cornerstone which was part of building facade since 1904 was removed for construction of the new narthex. 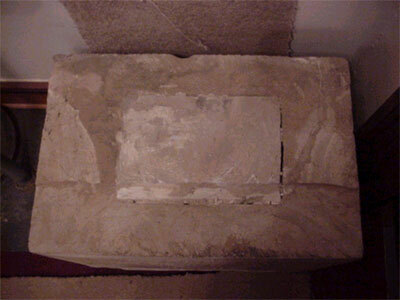 Upon removal it was discovered that the block of stone had a compartment. 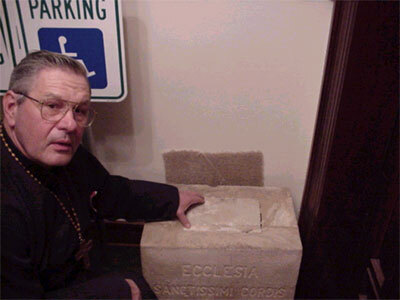 Fr Andrew inspected the block and phoned Fr. Homer the Rector of Sacred Heart Catholic Parish in Palos Hills. More research will be needed before a decision will be made to open it. St Luke welcomed it's new members today. Father Harrison prayed for them and asked us all to welcome and help them. The Prosphora (monastery baked altar bread) was donated today by the parish for our new members: Jim and Laura Paris, Dan Mahoney, Elvira Badica and Alexander, and Adolph Harrison (Laura had a baby girl). 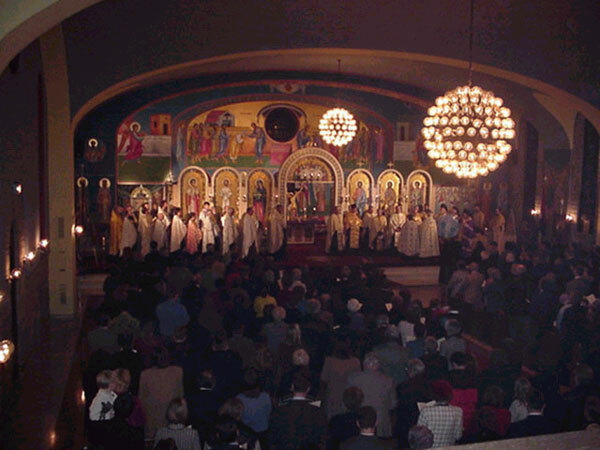 In addition, new members will receive an icon from the parish. We pray for them and welcome them into our family. Priest - These new members are given to your care. Love them as Christ loves you. Help them mature in the faith so they may fulfill Christ command to preach the gospel. The second phase of our bond program for the new building got underway today. An additional 200,000 in Church bonds are avialable for sale at highly favorable rates. If you missed out the first time, now is the time to get involved before they are gone again. A representative from the bond company spoke to the parish. Father Harrison also spoke to us about the need for us to tithe our 10 percent of the building costs and offered the building fund envelopes as a possible way to do this. He also suggested donations to the Buy a Brick program, the Bell Fund, or to the Adopt A Room program. Y.O. the St. Luke Youth Organization held a bake sale with the proceeds being donated to the Coptic Orphans. 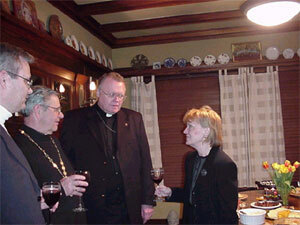 In addition to providing the parish with some tasty baked goods, they raised a nice amount to be given to the orphans.